Ready to take back control of your food? 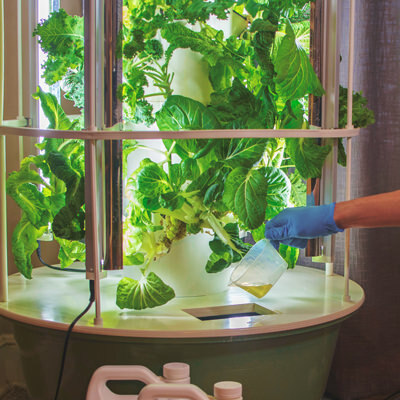 Harnessing state-of-the-art growing technology known as aeroponics, Tower Garden offers you a cleaner, simpler and more efficient way to grow fresh, healthy food for your family. An advanced form of hydroponics, aeroponics is the process of growing plants in an air or mist environment rather than soil. Aeroponic systems use water, liquid nutrients and a soilless growing medium to quickly and efficiently grow more colorful, tastier, better smelling and incredibly nutritious produce. Because there’s no dirt, there’s also no digging or weeding. Plus, you don’t have to worry about ground pests or contaminated soil. And did we mention Tower Garden’s vertical design uses 90% less space? That means you can grow food in some pretty interesting places. Tower Garden will arrive at your doorstep with seeds, nutrients, supplies—everything you need to get growing. 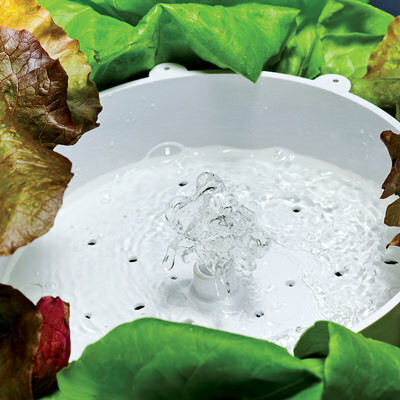 After about 20–25 minutes of minimal setup, here’s how your Tower Garden will function. 1.Plants grow in a soilless medium called rockwool. You’ll start seedlings using the kit we ship with every Tower Garden (unless you decide to buy seedlings). And when your seedlings are ready—usually about three weeks after germination—you’ll plant them in your Tower Garden. Instead of soil, Tower Garden plants grow in a medium called rockwool, which provides plant roots with oxygen and consistent moisture, encouraging rapid, healthy growth. 2.The reservoir stores the plant nutrient solution. Tower Garden Mineral Blend, our proprietary plant food, powers Tower Garden. 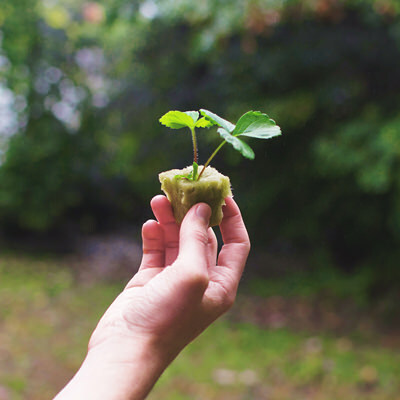 Containing the pure earth minerals essential to healthy plant development, the Mineral Blend provides an all-natural “shortcut” for plants, which typically must source nutrients from decomposing organic matter in soil. The result is greater nutrient uptake and superior growth for a range of plants. You’ll fill the 20-gallon reservoir at the base of your Tower Garden with a mixture of Mineral Blend and water. 3.The solution cascades down the Tower Garden, nourishing plants. A low-wattage, submersible pump in the reservoir pushes the nutrient solution to the top of the Tower Garden through a small central pipe. The nutrient solution then drips down the inside of the Tower Garden, evenly cascading over the exposed plant roots. A timer ensures this process repeats continuously—usually in 15-minute increments—to deliver the ideal amount of oxygen, water and nutrients to plants at the perfect time. 4. In a few weeks, plants are harvest‑ready! 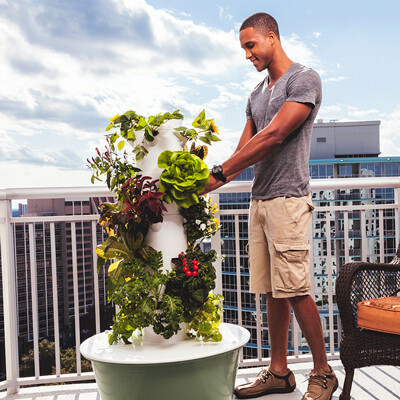 Aside from a few minor maintenance tasks, such as checking water levels and cleaning the pump filter, Tower Garden will take care of itself. And in just a few short weeks, you’ll be enjoying abundant homegrown produce, harvested at its peak (so you can be at yours). Still have questions about how Tower Garden works? 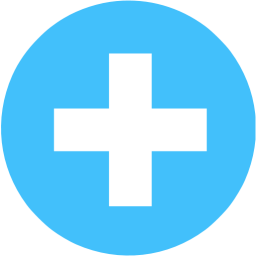 Visit the FAQs. Ready to Grow Your Own Fresh, Healthy Food?